In a fusion reactor, the heavy hydrogen atoms, deuterium and tritium, fuse into helium. During this process vast quantities of energy are released in the form of heat. The exhaust of a fusion reactor, also called a divertor, must be able to withstand this heat as well as large quantities of particles. The divertor of ITER, the experimental fusion reactor currently being constructed in the south of France, is made from tungsten due to the high heat resistance and good heat conductance of this material. For safety reasons only a small quantity of hydrogen may be present in the walls of the reactor. Tungsten is well-known for the fact that it can contain only a small quantity of hydrogen. However , the amount of hydrogen could strongly increase due to the impact of the high-energy neutrons that are released in the fusion process and that damage the tungsten. Researchers from the 'PSI-lab' research programme have recently shown that tungsten absorbs far less hydrogen than expected if the material is exposed to an extremely large flux of hydrogen particles. The researchers performed experiments using the linear plasma generator Pilot-PSI, in which the conditions that will occur in the ITER divertor are realistically simulated. The experiments demonstrated that for a large flux of particles only about one in every million hydrogen particles penetrates the tungsten. This fraction was found to be strongly dependent on the tungsten's temperature. The results point to the fact that fewer particles become trapped in the tungsten because a thin protective layer of hydrogen is formed on the tungsten's surface. Hydrogen atoms that reach the surface collide with the atoms in this protective layer and consequently lose so much energy that they cannot penetrate the tungsten but are instead deflected from it. The atoms located in the layer can penetrate the tungsten but must first of all pass an energy barrier to do this. This barrier is so high that this rarely happens and so the uptake of hydrogen by the tungsten is strongly reduced. Schematic representation of a tungsten surface that is exposed to a high flux of hydrogen particles (φplasma). The vast majority of particles is deflected (φback), only a small proportion penetrates (φin). The fraction (f) of particles that penetrates strongly depends on the temperature. In the case of a large particle flux, f is about one in one million. 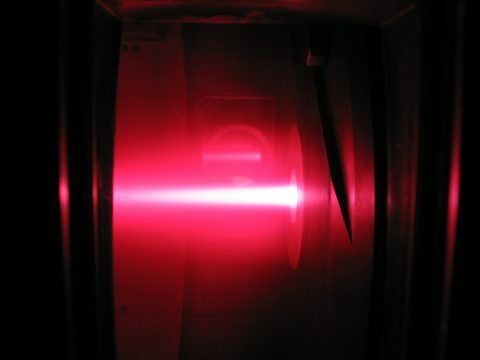 A beam of hydrogen plasma in Pilot-PSI falls from the left onto the test material. DIFFER's experiments for plasma-wall interaction can simulate the intense plasma conditions that will occur in the fusion experiment ITER.